This October, get ready for The Hydrogen Sonata, the new novel in Iain M. Banks' incredible Culture series. It's about what happens to an ancient civilization, the Gzilt, when they decide to sublime — and discover the dirty political underbelly of the singularity. We've got the first chapter for you right here. And here's the first chapter . . . In the dying days of the Gzilt civilisation, before its long-prepared-for elevation to something better and the celebrations to mark this momentous but joyful occasion, one of its last surviving ships encountered an alien vessel whose sole task was to deliver a very special party-goer to the festivities. The two craft met within the blast-shadow of the planetary fragment called Ablate, a narrow twisted scrue of rock three thousand kilometres long and shaped like the hole in a tornado. Ablate was all that was left of a planet destroyed deliberately two millennia earlier, shortly before it would have been destroyed naturally, by the supernova within whose out-rushing sphere of debris, gasses and radiation it remained, like an arrowhead plunging ever downwards into the rising, roiling heat and sparks of a great fire. Ablate itself was anything but natural. Roughly hewn as though sliced from some spherical cake, its tip and the first few hundred kilometres of its narrow end had, originally, been made up of the metallic material which had formed the very centre of the now-defunct small planet while its wider end - a rough circle a couple of hundred kilometres across - looked like a gently curved dome and had been part of the barren globe's rocky surface. Kept pointed - aimed - into the supernova's blast front by engines keeled within hyperspace, all of that original tip and most of those next few hundred kilometres of layered metallic ores had abraded away over the last nineteen hundred years, boiled and scoured into oblivion by the still-expanding fires of the exploded star's nebula. The multi-coloured skies around Ablate, filled with the vast glowing clouds of stellar debris and the gasses and dusts resulting from its own slow wearing-away, were some of the most calculatedly spectacular in the civilised galaxy, and that was why Ablate was a place of special significance to the people who called themselves the Gzilt. The Gzilt had rescued this portion of world from the annihilation of the supernova and they had anchored within it the star drives and field projectors which kept it respectively stable and - just, in the centre of that rough circle of what had been the planet's dusty surface - habitable. The alien ship was an irregular, fuzzy-looking bubble of dark spheres, measuring barely a hundred metres along its principal axis. It was lit from around and above by the spectrum of colours radiating from the clouds of the supernova, and from below by the gentle blue glow of the world-fragment's only obvious non-natural feature: a scooped, domed bowl a handful of kilometres across that lay on that fractured, unshadowed surface like a slightly too perfect crater. The bowl was an oasis of warmth, moisture and atmosphere on that cold, dry, airless surface; within its gauzy layers of containment it held the sort of parks, lakes, carefully proportioned buildings and lush but managed tracts of vegetation favoured by many types of humanoids. The Gzilt ship dwarfed the alien one; it looked like a thousand dark broadswords gathered into a god's fist and brandished at the skies. It crossed the boundary of glowing, outflowing dusts and swirling gasses at the periphery of Ablate's circular outer surface - allowing its own fields to create a series of brief, tearing, billowing folds within the curtains of light there - then moved slowly towards and over the glowing bowl and the collection of dark bubbles that was the alien ship, until its spiny bulk hung directly above both, occluding a large part of the supernova clouds and draping its bristled shadow over the ship and the dome below. ~Greetings. I am the Zihdren-Remnanter Ceremonial Representative Carrying Ship Exaltation-Parsimony III. You, I understand, are the Gzilt IR-FWS 8*Churkun. I am honoured to be invited here and to make your acquaintance. ~That is interesting, came the reply. ~A Zihdren-Remnanter Ceremonial Representative Carrying Ship, you say? ~Well, indeed I am. Somewhat obviously. ~Indeed. And, if I may so claim, both in outward form and unshielded emissive signature. ~Indeed. . . May I make an observation? ~You may. We await it. ~As you say, strange times. Times that bring uninvited guests and unwelcome attentions in the shape of those who would exploit our reduced numbers and distracted state. ~There was no signal outage or protocol disruption then, nor is there now. I interrupted you. I am doing so again. ~Ah. Then I was not mistaken. Might I just check; am I addressing the captain of the 8*Churkuns virtual crew? ~Ah. Well, then - Captain - we appear to have started out from positions involving inharmonious premises. That is unfortunate. I would hope that, nevertheless, you might appreciate my disquiet - one might even characterise it as disappointment - at the fact that we appear to have initiated our association here on such an unfortunate tack. Please; tell me what I might do to help bring us back onto a more agreeable course. ~The preparations for our Sublimation have encouraged those of a parasitical nature. Alien presences wishing to profit from our abandonment of the Real, appropriating what treasure we might leave behind. They circle. ~I understand. I am, of course, aware of those you talk of. It was so with those whose memory I am honoured to represent: your flattered mentors and barely required civilisational guides, the Zihdren. ~Whom you claim to represent. ~Patently. I must say that I was in no doubt regarding your ship class and martial status. The eight-star, Indefinite Range, Full Weapon Spectrum Gzilt contemporary ship-type you represent is entirely familiar to us. ~Things have changed, formalities slipped, protocols been relaxed. This vessel is four point six centuries old and yet has never fired a shot in anger. Now, with most of our kind already gone, preparing the way ahead in the Sublime, we find ourselves defending the disparate items of our about-to-be legacy from those who would use the fruits of our genius and labour to cheat their way further along the path to this point, a point that we achieved entirely honourably and without such opportunistic larceny. ~Part of the deception such entities employ is impersonating the vessels and beings of others. I am deeming you to be doing so at this moment. We have scanned you and determined that you are carrying something which is entirely shielded from honest view. ~What? My dear Captain, you cannot just "deem" me to be employing any deception! That is absurd! And as for the only fully shielded substrate within myself, that is my cargo, my complement of precisely one Ceremonial Guest, our single humanoid expression of respect, expected and invited by the Gzilt people specifically to celebrate their upcoming Sublimation! Of course this entity bears a message from the Zihdren-Remnanter to the Gzilt which I am not privy to! There can be nothing strange, unprecedented or worrying about such a thing, can there? The Gzilt have been party to the relevant diplomatic and ambassadorial protocols for millennia, without a flutter of complaint. A tiny scrap of the Real bids farewell to you while at the same time representing those who would most happily welcome you to the Sublime! ~There is deceit here, something hidden. We can see it even if you cannot. ~What are you talking about? I am sorry. I have had enough of this. Your behaviour and demeanour goes beyond even the most cautious and watchful warship-normal and frankly risks slipping into outright paranoia. I am withdrawing; you will have to excuse me. Farewell. ~Release in full the information contained within the shielded substrate. ~. . . Have you put a signal containment around me? Have you any idea of the consequences-? ~. . . contained within the shielded substrate. Release in full the information contained within the shielded substrate. ~. . . Drop the signal containment around me immediately! And desist from jamming my engine fields at once! I am about to initiate a full-power high-acceleration pull-away manoeuvre irrespective of your current interference, and any damage accrued either by myself or you will be your responsibility, not mine! The Zihdren-Remnanter and the Zihdren themselves will hear of this act of barbarism; do not make it worse for yourself! ~. . . That my drive components have not just exploded thanks to your unwarranted barbarism is due more to my ability to finesse than your brutal use of overwhelming power. I am, as is now abundantly clear to both of us, effecti fvely helpless. This is a result and a situation that does you no honour whatsoever, believe me. I must - with utter reluctance and under extreme protest, both personal and formal - ask whether, if I do release in full the information contained inside the shielded substrate within myself, you will then drop the signal containment around me and desist from jamming my engine fields, allowing me both to signal and to depart. ~And I will be allowed to signal and to depart? ~Scanned. We present the results. ~. . . Interesting, as you might put it. I see. That is not a message that I would have anticipated. I now appreciate, as I am sure you do, too, why there was a degree of secrecy regarding the contents. While it would not normally be any part of my responsibility to make comment on such matters, I would, speaking personally, argue that said contents themselves constitute a kind of apology. This is a type of admission, even a confession. I understand that such. . . accountings are often a part of the business of species and civilisations Subliming; matters are settled, lines are drawn under certain proceedings. . . However, be that as it may, it was my mission only to deliver this Ceremonial Guest entity while being kept entirely ignorant of the content, substance and import of its message. Accordingly, I consider that I have, albeit in most unexpected and trying circumstances, discharged my duty, and so would ask to be allowed to communicate this bizarre turn of events to those who tasked me so, and to withdraw from Gzilt jurisdictional space to await further instructions. I have held up my end of our bargain and duly released, in full, the information contained inside the shielded substrate within myself. If you'd be so kind, I now require you to fulfil your promise by dropping the signal containment around me and ceasing to jam my engine fields. The Gzilt ship 8*Churkun - a battleship in all but name - kept the tiny alien vessel effectively crushed underneath it as it directed fire from a pair of its close-range, medium-power plasma chambers into the vessel, and - beneath it, beyond it - into the emptily glowing blue bowl of the crater facility, destroying the ship utterly and blowing the crater facility apart. 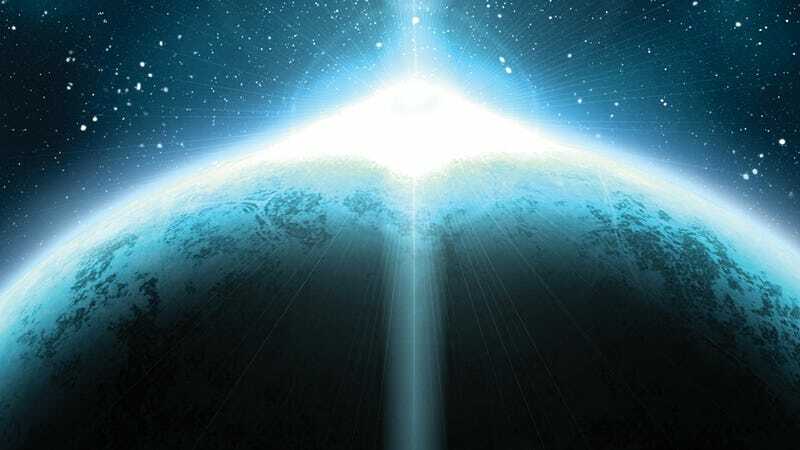 The weapon-pulse was so strong it continued into the surface of the planetary fragment to a depth of several kilometres, blasting a brief, livid tunnel a hundred metres across vertically into the rock. A torrent of lava splashed out around the ship's outermost protective fields as the tunnel collapsed, the spattering, cooling rain of molten rock following the pulverised, atomised debris of the Zihdren-Remnanter ship and the centre of the blue-glowing bowl as they too flew into the colour-wild skies above Ablate. At the boundaries of the world's truncated horizon, some larger parts of the obliterated dome, still whirling away from the initial explosion, burned bright as flame as they plunged into the surrounding curtains of light. Deep beneath its assaulted surface, automatic systems sensed the blast and the resulting wobble in the tiny world's course, and corrected for it. Where the little blue oasis of light and life had been there was now a larger, deeper crater, glowing white and yellow and red from its boiling centre to its ragged edge. By the time the crater surface had cooled sufficiently to show how it would look once it had solidified completely, the 8*Churkun was long gone. Of the other ship, apart from a new set of already fading folds of light in the skies above Ablate, there was no trace whatsoever. Hydrogen Sonata will published in the US and the UK on October 12.